SUMMARY: Tells the story of Rump, a boy who discovers he can spin straw into gold. WHAT I LIKED: The fairy tale spin. Rump takes readers through the entire story of Rumpelstiltskin, including how Rump discovered his "gift," how he got tangled up with the miller's daughter and the lies that led her to spinning straw into gold for the king. It explores how Rump ended up with the Queen's baby and the final riddle of how the queen "guesses" his true name. Throughout all of this, Rump is the sympathetic character; it is the miller's lies and his daughter's stupidity, not Rump's inherent evil, that rest at the heart of the Rumpelstiltskin story. Though Rump isn't perfect and succumbs to his own greed for a time, it is Rump's story, and the reader's sympathies will lie with him. I always love when fairy tales get tangled up in other fairy tales! Red Riding Hood is Rump's surly best friend, Red's grandma is a witch, the apple in Snow White has become a poisoned apple tree. I loved the gold-obsessed pixies and the drooling trolls. 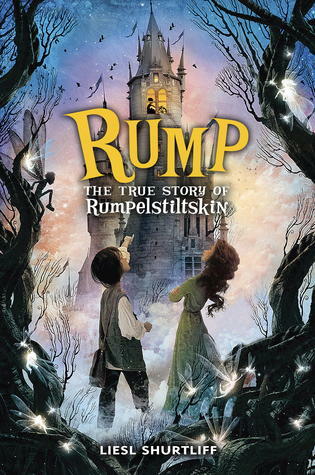 With a varied cast of fairy tale characters and frequent changes in scenery, Rump would make an excellent elementary or middle school read-aloud. Readers who enjoy doing voices when they read aloud will especially love this one for storytime. WHAT I DIDN'T LIKE: My only complaint is that parts of the story are a little dull. I thought I would zip right through this book, but it ended up taking me several days because there isn't really a lot of action. Rump wanders from town to town, thinking about his predicament and how his lack of a real name causes him so much trouble. It's not a huge deal, but I wasn't turning the pages as voraciously as I expected. THE BOTTOM LINE: Cool fairy tale tie-ins make this Rumpelstiltskin spin-off a must for elementary and middle school libraries. STATUS IN MY LIBRARY: On order. This will be easy to booktalk! thanks for another great review! I liked this one too!